I have missed the blog so much, the end of the year has been much more intense than I had anticipated – so many personal projects with deadlines just happened to fall within this period and given that I ain’t no superwoman, I must admit, it’s been hard to juggle everything effectively but I think I should be gradually getting back on track. This was perhaps the most epic part of the entire experience, it still feels so surreal. If you know who the elders are, you would know how rare it is to have so have them in one place and at the same time. The elders are an independent group of global leaders convened by Nelson Mandela working together for peace and human rights. 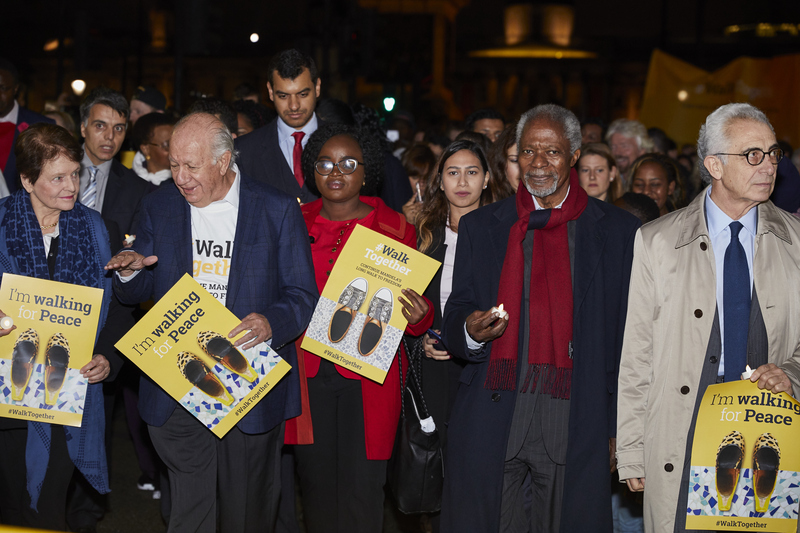 The event we had with them was held in commemoration of Nelson Mandela’s Centenary celebration, the purpose was to walk together (literally and figuratively) to find pathways to peace. The event started at Trafalgar square where Graca Machel and Kofi Annan gave sobering speeches about the state of our world today and the need for leaders to step up, have conversations and reduce the tensions faced in various regions. After this we walked from Trafalgar square to a venue near Parliament square where we had an evening event with them and a reception. It was very nice to hear their thoughts on a variety of issues especially the biggest challenges facing our world today. For me, it was really humbling and encouraging because these are the people that inspire me to keep doing my little part to make the world a better place ….so seeing them, sharing the same space with them and even breathing the same air as them were stuff only dreams are made of. At the reception for the Elders, clearly Richard Branson thought we all looked too serious and decided to spice things up..haha! We had a conference at the UK Houses of Parliament titled ‘ ‘Fast Forward: Preparing for the World Ahead of Us’ where we had the opportunity to interact with members of the UK Parliament in small groups and discuss some of the biggest issues in our world – Technology, Migration and Climate change and make policy recommendations on how they can be addressed. I was in the Technology group and I learnt a lot from the debates. We acknowledged the enormous benefits that technology that have brought to our world but we also noted some of the huge challenges that have arisen. First, the amount of data many Tech firms have makes users extremely vulnerable to them; second, the rise of automation is putting the jobs and livelihoods of people at risk, a Mexican colleague shared an example of how a Coca Cola plant that used to have 2000 employees now have only 4 since they automated their processes. These discussions are particularly important for sub-Saharan Africa as we are highly vulnerable to such disruptions given that we operate at the lower-end of the global value chain which involves a lot of repetitive processes; worse still, the level of our education and skills development remains far behind the rate of technological advancements. A global code of conduct, that will guide technological innovations across the world and will be developed by a multi-stakeholder group – academia, youth, women, public and private sector. Call for responsible innovation by companies to make provisions and take responsibility for the negative impacts of their innovation. The need for a new approach to education and skills development to equip young people for the future. A highlight for me was meeting Pulitzer winning Writer and New York Time Columnist, Thomas Friedman who is such an embodiment of knowledge, he spoke about how technology has transformed the world we live in and how leaders across the world are struggling to keep up with the pace of technological advancements. His presentation was so good, I had to purchase his book ‘Thank you for being late’, I have only started reading it and its been a pleasant read thus far. Then we met a Nigerian – British MP Kate Osamor who is the Shadow secretary of State for International Development. We also met Ed Milliband, former opposition Leader. We ended the day with a private reception at the home of the Speaker of the UK Parliament. With the Speaker of Parliament, yep the person in the Arsenal jersey! We visited the BBC to learn more about their work, operations, their use of analytics and their presence in Africa. it was interesting to learn that one-third of their audience is in sub-Saharan Africa. Later that day, we visited Lambeth Palace, the London residence of the Archbishop of Canterbury. We were received by Sarah Snyder the Archbishop of Canterbury’s Advisor for Reconciliation where we learnt about their work on peacebuilding and reconciliation across the world. There was something truly peace, calming and serene about the place – would absolutely love to visit again! We visited 10. Downing street – the headquarters of the UK government and the official residence of the Prime Minister. It was also one of those surreal experiences, having grown up seeing the famous No. 10 door on TV – the place where historic decisions and announcements have been made. We were received by Mark Field MP (Minister of State for the Foreign and Commonwealth Office).to whom we presented all our policy recommendations on the various issue topics. To describe this experience as ‘epic’ does not do it justice. It is one of those experiences that give you a fresh perspective on life and enables you reconnect with your life’s purpose (at least that was my experience). The positivity and optimism filled me with so much hope especially for Nigeria – honestly, I don’t think I have met a more exceptional Nigerian group, despite our differences we had a great experience without any rancor or problems whatsoever. All of them are doing tangible and great work and are truly committed to ensuring that our country works and offers more hope, I am so proud of them as they truly inspired me. The programme was intense and short but even in that limited time deep friendships and wonderful connections were made which made it very difficult for us to say goodbye as shown in the pictures above! I am thankful to the British Council for this truly amazing opportunity; for the opportunity to connect with like-minded people from across the world; to reconnect with my life’s purpose and to realise even in the midst of all the negativity in our world, the future remains filled with limitless possibilities. This marks the ends of the series of the British Council’s Future Leaders Connect Programme, I hope you are inspired to apply for the programme. Previous British Council Future leaders connect diaries – Part 2; My EPIC Cambridge experience!! Next Happy new year!! Top 2017 blogs and New features for 2018.